From top tips for early cross-country pilots to achieve faster flights and greater distances to the challenges ofGrand Prix racing, you can read about it in the Aug/Sept issue of S&G. 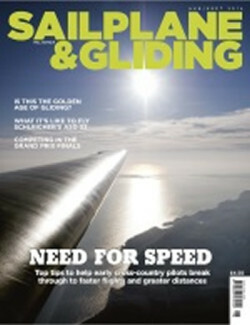 You can also find out what it is like to fly the ASG 32 and reflect on whether now is a golden age of gliding. If you want to make the most of the day – and move your performance up a notch – see this issue’s Ask the Coach feature, which looks at techniques to help up-and-coming pilots increase their task speed and conquer greater distances. Tony Cronshaw shares top tips from leading coaches Kevin Atkinson and Bernard Eckey. Phil King had a distance challenge in mind when he set a 500km task on 19 March. Falling short by just 28km, Phil’s wave flight is still thought to be the longest distance flown entirely in Wales. Mike Young is no stranger to fast speeds over long distances. He recently represented Great Britain in the finals of the World Sailplane Grand Prix at Sisteron and reflects on the challenges of a brutal scoring system that can take you from hero to zero (or vice versa), while encouraging a less conservative style of flying. The maiden flight of Schleicher’s ASG 32 took place in Germany on 31 May. Australian coach Bernard Eckey was invited to fly it just a few days later and says that, being designed without compromises, it has what it takes to become the leading model in the 20m two-seater FAI class. Mike Bird looks at how modern wing sections and materials yielded great improvements in performance between the 1950s and 1980s, with smaller gains since. Where, wonders Mike, is the next S-curve coming from? Also in this issue: EuroFOX in display first at AeroExpo, Sywell. Mick Hunton and Andy Monk reflect on how much beginners can achieve on a well-organised expedition to Sisteron. Tim Scorer offers advice on forming a syndicate. Steve Pozerskis explains why preparation really is the key to success when competing. Bernard Eckey continues the debate on water ballast with his opinion on the pros and cons. Susan Newby meets the group of glider pilots invited to take part in Duxford’s D-Day 70th anniversary airshow. Ed Foxon recounts the tale of a nightmare retrieve. Frank Mcloughlin explains how he helped rewire a glider. Andrew Stewart reflects on an enjoyment of flying shared with artist Alan Davie. Development Officer Alison Randle reminds clubs of the resources available to them online. Pete Stratten has advice on keeping your licence valid. Bruce Stephenson reports on vintage events. Plus, there are many more of your stunning images in the Gallery pages. ASG 32: set to be a leader? Glider development: a golden age? Plan to form a syndicate? On 19 March, Phil King aimed for a 500km in Welsh wave. Falling short by just 28km, could this be the longest flight in Wales?